Continuous integration, continuous delivery (CI/CD), and continuous deployment have drastically changed the mobile software development cycle, especially with the different continuous integration tools developers now use to ship their apps. As software development cycles are becoming faster, time to deploy apps and delivery cycles are becoming shorter and shorter. Instead of companies shipping new app releases on a monthly or quarterly basis, this can now be done on a weekly or daily basis, and even sometimes multiple times a day. This has raised the need for automation in terms of integration, delivery, and deployment so that in most cases, apps can easily update without users even noticing or having to interfere. Continuous integration combines together the work of multiple developers at most companies and is usually done at least daily to help detect any bugs early on. Continuous delivery helps you build your app in a way so that it can be ready whenever you want it to be released at any point in time. Continuous deployment is an automation process that lets the changes you make instantly get deployed through the pipeline. Now there are many mobile continuous integration tools out there that help you automate this process and many reasons why you should invest in one, including reducing the number of bugs, errors, refactoring risk, and defects costs as well as an overall increase in the speed of your development to deployment cycles.There are also multiple things that should factor into your decision about which one of the continuous integration tools you should go with, including features, hosting, support, integrations provided, pricing, and more. 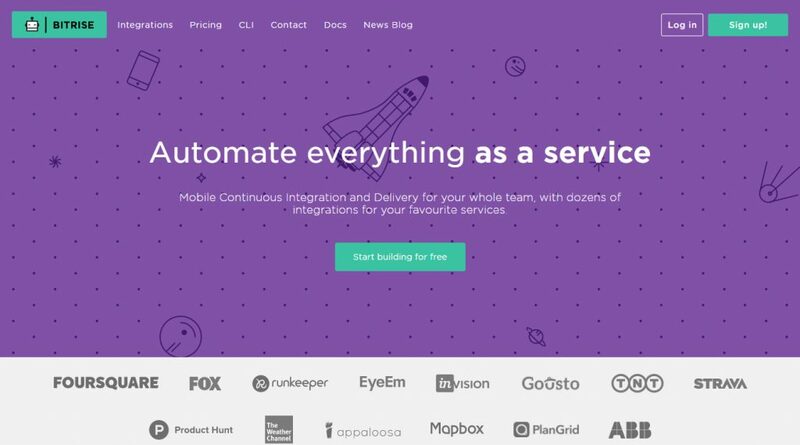 So below is a list of the top mobile continuous integration tools to choose from based on need. 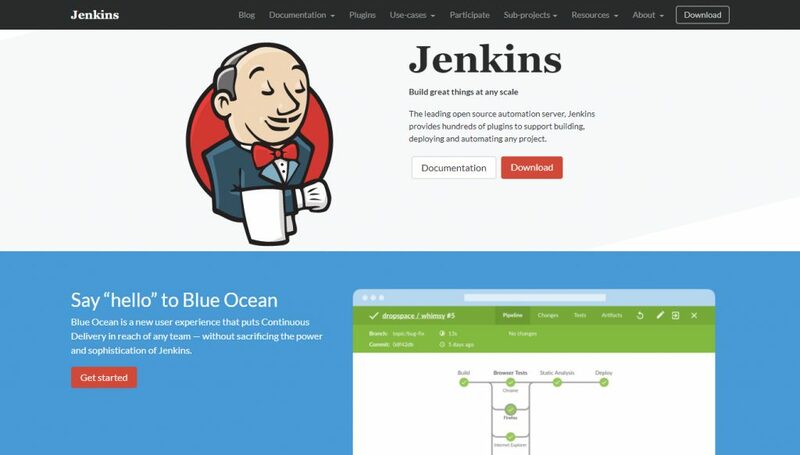 Jenkins, originally founded in 2006 as “Hudson”, is the leading open-source continuous integration server. Using an extensible, plugin-based architecture, developers have created over 300 plugins to adapt Jenkins to a multitude of build, test, and deployment automation workloads. In 2015, Jenkins surpassed 100,000 known installations, making it the most widely deployed automation server. Users: Facebook, Pinterest, HotelTonight, LinkedIn, HootSuite, eBay, Netflix, Pandora, and more. Integrations: Slack, Testdroid, Hall, Coveralls, AppBlade, Ghost Inspector, Bigpanda, SonarQube, BlazeMeter, AppThwack, fastlane, Insight, Lita, DotCi, Datadog, AWS CodeDeploy, VAddy, Flowdock, Gitcolony, fabric8, Runscope, TestFairy, Codecov, uberalls, Codacy, ContainerShip, Visual Studio Team Services, Codefresh, Codenvy, Rancher, PullReview, AWS CodePipeline, AWS CodeCommit, Testmunk, Mattermost, DCHQ, ElasticBox, Distelli, Deveo, Gitter, RhodeCode, Phabricator, Sauce Labs, Git-appraise, Cabot, Blue Ocean, Flood, IO, Server Density, BrowserStack, Zulip, Geckoboard, and Hyper. CircleCI allows developers to rapidly release code (for web and mobile apps) they trust by automating the build, test, and deploy process. CircleCI enables developers to detect and fix bugs before they even reach customers. 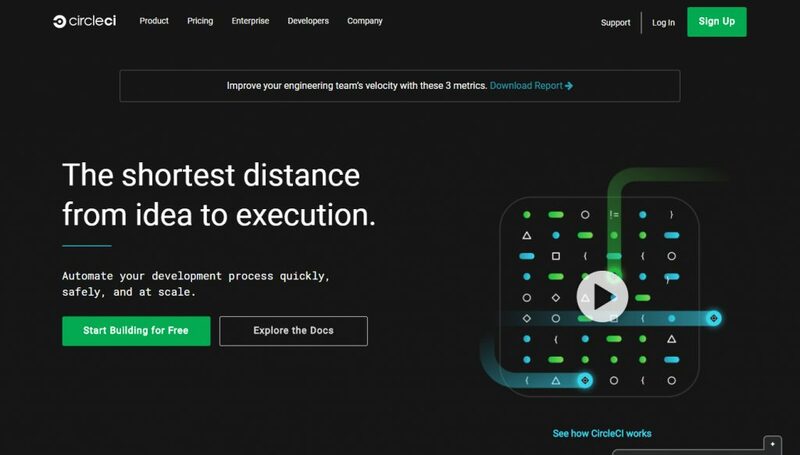 Thousands of leading companies rely on CircleCI to accelerate delivery of their code and enable developers to focus on creating business value fast. Users: GoPro, Docker, Facebook, Spotify, Segment, Shopify, and more. Pricing: Free. Paid plans start at $50 per month. 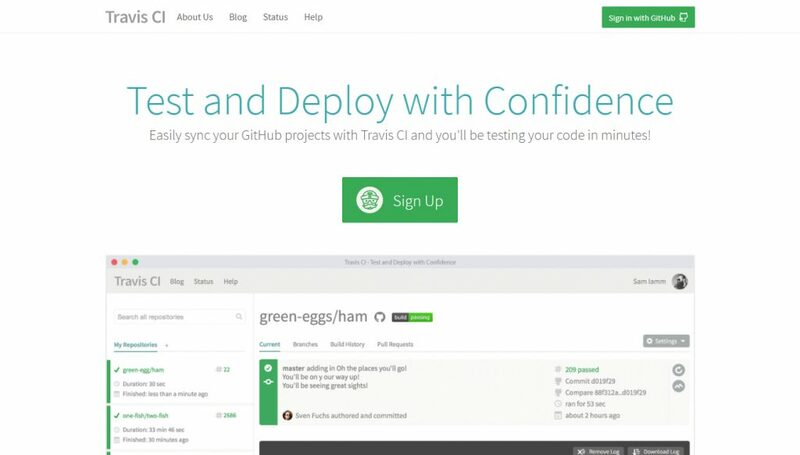 Travis CI is a hosted, distributed continuous integration service used to build and test software projects hosted at GitHub. It provides custom deployments of a proprietary version on the customer’s own hardware. Travis CI is great to use for open source projects as it doesn’t charge any fees for them. Users: Facebook, Heroku, Mozilla, Twitter, Zendesk, Rails, and more. Integrations: GitHub, MySQL, npm, Amazon S3, Heroku, AWS CodeDeploy, OpenShift, Engine Yard Cloud, Nodejitsu, cloudControl, Coveralls, Slack, Ghost Inspector, HubCommander, fastlane, Coverity Scan, BlazeMeter, Lita, Flowdock, VAddy, TestFairy, biicode, ContainerShip, StackStorm, PullReview, Testmunk, Cloud 66, Distelli, Gitter, Sauce Labs, Flood IO, SonarQube, FOSSA, BrowserStack, Dockbit, Zulip, OpsGenie. Pricing: Free for open source projects. Plans start at $69 per month. Bitrise is a continous integration and delivery platform as a service (PaaS) with a main focus on mobile app development (iOS, Android and Xamarin). You can automate the testing and deployment of your apps with just a few clicks. Every build runs in its own virtual machine, and all data is discarded at the end of the build so you don’t need your computer for building. The steps you can use in your workflow are open source so that you can modify, and share them as you like, or create new ones and it integrates with the services you love to use, like Slack, HipChat, HockeyApp and Crashlytics. Users: Foursquare, Fox, Invision, Product Hunt, Appaloosa, The Weather Channel, and more. Integrations: GitHub, Slack, Amazon S3, Bitbucket, Ruby, JIRA, gulp, Android SDK, React Native, Gradle, Crashlytics, TestFlight, Apache Cordova, Codecov, fastlane, Flowdock, Raygun, TestFairy, AWS Device Farm, Xamarin Test Cloud, HipChat, Twilio, HockeyApp, Parse, Mailgun, Coveralls, Xamarin, Bower, and more. Pricing: Free. Paid plans start at $45 per month per concurrency. 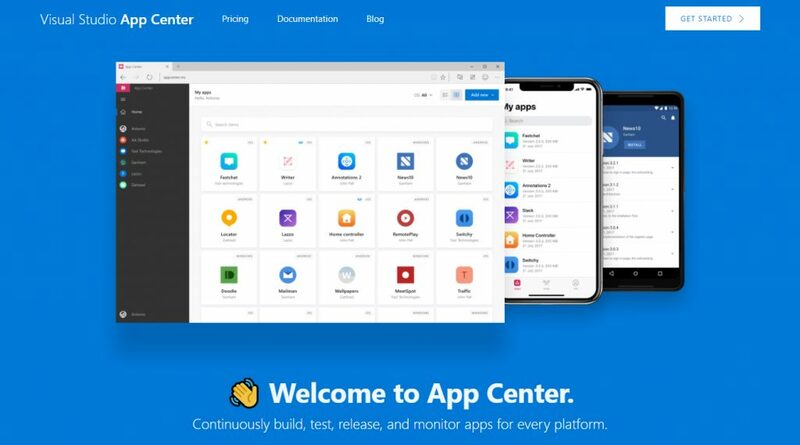 Microsoft’s App Center brings together multiple services, commonly used by mobile developers, into a single, integrated product. You can build, test, distribute, and monitor your mobile apps. It allows you to create an installable app package automatically with every push to your repository which supports GitHub, or Git repos on Bitbucket and Visual Studio Team Services (VSTS) with no additional build hardware required. You can run tests on more than 400 unique device configurations then have your users install the app via email distribution lists for testing, much as they’d download an app from the app store. Users: Quora, Fox Sports, Highrise, Good Food, FreshDirect, and more. Integrations: Github, Bitbucket, Visual Studios Team Services, Slack, Microsoft Teams, and more. Pricing: Free. Paid plans are flexible, adding +$40 per month per build concurrency, +$99 per month per test device concurrency, and +$10 per month per 100k monthly active devices. 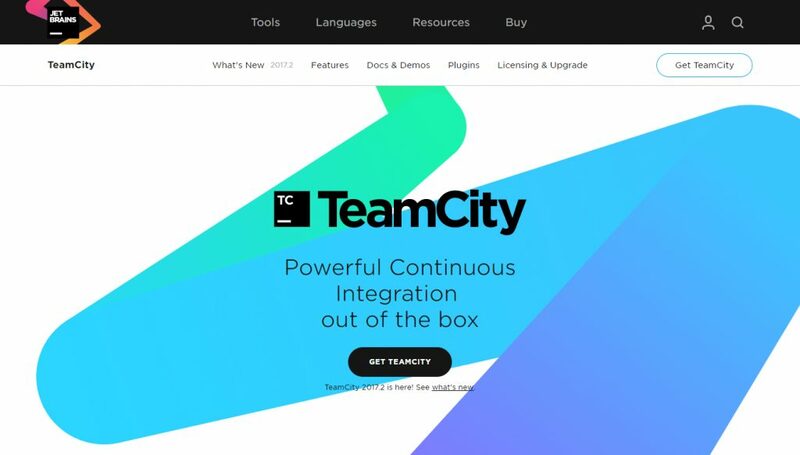 TeamCity is a user-friendly continuous integration server for professional developers, build engineers, and DevOps. It is trivial to setup and absolutely free for small teams and open source projects. It allows you to automate code analyzing, compiling, and testing processes, with instant feedback on build progress, problems, and test failures, all in a simple, intuitive web interface. You can also run multiple builds and tests under different configurations and platforms simultaneously while having build history insights with customizable statistics on build duration, success rate, code quality, and custom metrics. Users: eBay, Apple, HP, Airbnb, Salesforce, Stack Overflow, and more. Integrations: Slack, Amazon Web Services, Docker Cloud, Google Tag Manager, Kubernetes, BlazeMeter, Insight, Datadog, Deveo, RhodeCode, Sauce Labs, SonarQube, BrowserStack, Zulip, Geckoboard, and more. Pricing: Free. Paid plans start at $299. GoCD is an open source continuous delivery server. It offers businesses a first-class build and deployment engine for complete control and visibility. It offers model complex workflows with dependency management and parallel execution as well as manual triggers, allowing deployment on any version at anytime while being securable and audit-able. It lets you run tests written in most languages or frameworks, provides informative testing reports, and allows you to compare both files and commit messages across any two arbitrary builds. It also helps you eliminate bottlenecks by providing trivial parallel execution across pipelines, platforms, versions, branches, etc. Users: Hazeorid, OpenX, Satellid, ThoughtWorks, and more. Integrations: Atlassian, GitHub, GitLab, Docker, Slack, Amazon Web Services, HipChat, and more. Pricing: Free trial. Paid plans start at $5,000 per year. 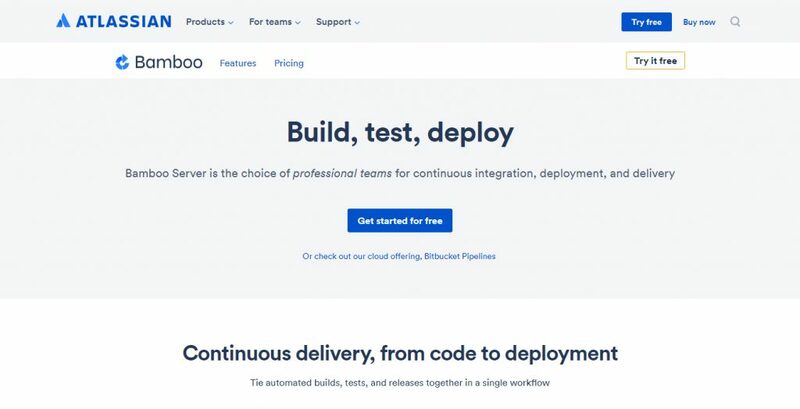 Atlassian’s Bamboo is another great option for continuous integration, deployment, and delivery. It allows you to create multi-stage build plans, set up triggers to start builds upon commits, and assign agents to your critical builds and deployments. You can also run automated tests in Bamboo to regress your products thoroughly with each change. Parallel automated tests unleash the power of Agile Development and make catching bugs easier and faster. Users: StumbleUpon, Poll Everywhere, Firehose, Interlude, Kaazing, and more. Integrations: AWS CodeDeploy, Docker, Fisheye, Crucible, Bitbucket, Jira, Confluence, HipChat, GitLab, Visual Studio, Heroku, Octopus Deploy, Sauce Labs, BlazeMeter, Flowdock, RhodeCode, SonarQube, Sonatype, SourceClear, JFrog, BrowserStack, and Zephyr. Pricing: Free trial. Paid plans start at $10. GitLab comes with built-in continuous integration, continuous deployment, and continuous delivery support to build, test, and deploy your application. If you configure your GitLab project to use a Runner, then each merge request or push triggers your CI pipeline. GitLab CI/CD offers the same great experience as GitLab, which is familiar and easy to use. The tests are distributed on separate machines, of which you can add as many as you want. Each build can be split in multiple jobs that run in parallel on multiple machines. Users: Electronic Arts, Uber, AVG, Sony, and more. Integrations: GitLab, Codeship, Hyper, Jira, Jenkins, Bitbucket, Kerberos, Trello, and more. Pricing: Free. Paid plans start at $4 per user per month. Codeship runs your automated tests and configured deployment when you push to your repository. It takes care of managing and scaling the infrastructure so that you are able to test and release more frequently and get faster feedback for building the product your users need. You can easily set up Codeship with Github or Bitbucket and trigger your automated tests with a simple push to your repository as well as set up powerful deployment pipelines that let you deploy with ease and confidence multiple times a day..
Users: Product Hunt, Treehouse, Sportsy, Ztory, and more. Integrations: GitHub, Slack, Amazon EC2, Bitbucket, Heroku, GitLab, Google App Engine, HipChat, Google Compute Engine, Capistrano, GitLab CI, Flowdock, AWS CodeDeploy, GitHub Enterprise, Cloud Foundry, Modulus, Engine Yard Cloud, Nodejitsu, Campfire, Ninefold, cloudControl, dotCloud, Grove, AWS Elastic Beanstalk , Coveralls, VAddy, biicode, Codenvy, PullReview, Rainforest QA, Distelli, Hosted Graphite, Mixmax, Dockbit, Zulip, and more. Pricing: Free. Paid plans start at $49 per month. 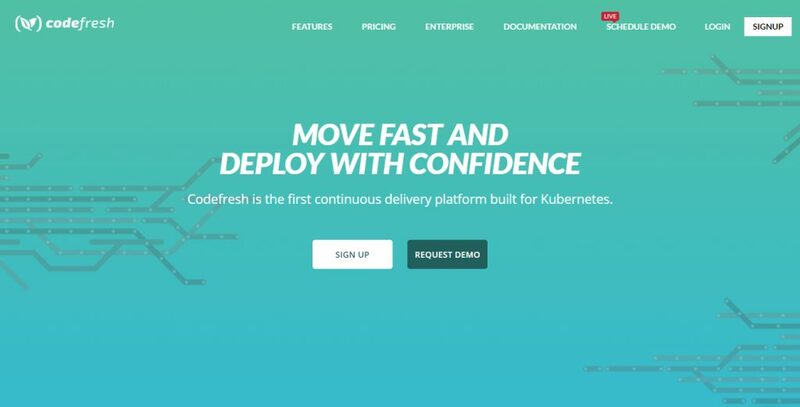 Codefresh offers powerful CI/CD for Docker and Kubernetes, allowing you to get faster builds, native testing for micro-services, and streamlined deployment to Kubernetes. It is built on Kubernetes and takes full advantage of layer caching and an embedded registry to seriously speed up build times. Each pipeline step runs in its own container with a shared volume and variables between steps. Users: FamilySearch, Steelcase, Tivix, Parkhub, and more. Integrations: Jenkins, AWS, GCP, Slack, HipChat, Docker, Kubernetes, Bitbucket, Bitbucket Server, Github, Bintray, Sauce Labs, BlazeMeter, and more. Pricing: Free. Paid plans start at $69 per month. Nevercode is one of the relatively new continuous integration tools that offers automatic setup for iOS, Android, Cordova, Ionic, and React Native projects. Its concurrent builds feature lets you automate several builds simultaneously and faster where with every code push to Bitbucket, GitHub or GitLab, it builds your project for you. It offers data encryption for all sensitive data and no code is stored on their servers. You can even set specific user roles with their team access control feature, as well as share the status of your pull requests, test results, and builds via Slack, HipChat, e-mail, and many other channels. Users: Mooncascade, Sainsbury’s, ingogo, Thunderhead, and more. Integrations: GitHub, HipChat, BitBucket, AWS, TestFlight, Crashlytics, Cocoapods, TestFairy, Slack, Relution, Jasmine, HockeyApp, iTunes Connect, Gradle Build Tool, Espresso, Robotium, Robolectric, Arma, Protractor, and more. Pricing: Plans start at $5.99 per month. Learn how Instabug can help you iterate faster and build better apps through bug reporting, crash reporting, and in-app surveys. ?